Bollywood star Shahid Kapoor is back on Twitter a day after his official account on the microblogging site was hacked. 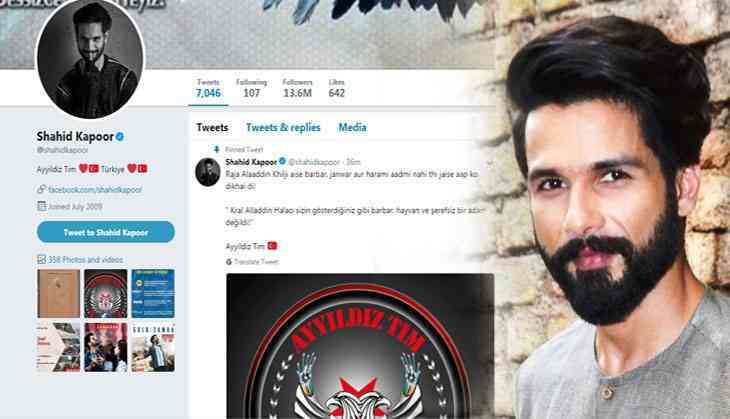 The 37-year-old actor, whose account was reportedly hacked by a Turkish hacker group, asked his fans to ignore any kind of communication from his handle in the last 24 hours. "Hey guys, finally I am back on twitter. Yes it was hacked. Kindly ignore any communication that came from my handle in the last 24 hours," Shahid tweeted on Friday. Cyber group, named Ayyildiz Tim, posted a series of tweets in Turkish language and in one of them, it criticised the portrayal of Alauddin Khilji in Shahid's film "Padmaavat" which released in January this year. Shahid played the role of Raja Ratan Singh while Khilji was portrayed by Ranveer Singh. The Twitter handle was restored after an hour during which the group posted close to 20 tweets.